Roxane Coss (Moore) is a famous American soprano who travels to a military dictatorship in South America, to give a private concert at the birthday party of a rich Japanese industrialist (Watanabe). Just as the gathering convenes, the house is taken over by guerrillas, led by General Benjamin (Bichir), demanding the release of their imprisoned comrades. A month long standoff ensues in which hostages and captors must overcome their differences and find their shared humanity in the face of impending disaster. 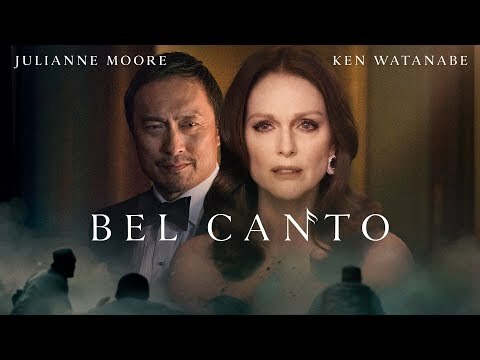 Bel Canto was released on VOD 217d ago in the US. Notify me when Bel Canto is available. Based on 6 Bel Canto reviews, Bel Canto gets an average review score of 59. The big-screen adaptation of Ann Patchett's novel stars Julianne Moore and Ken Watanabe as characters caught up in a hostage drama in an unnamed South American country. Ann Patchett’s acclaimed novel, about the 1996 terrorist takeover of the Japanese Embassy in Lima, Peru, finally gets a screen version. Grand opera meets soap opera in Paul Weitz's sincere but silly adaptation of Ann Patchett's 2001 bestseller.